First, it is lighter and thinner without a backlight. The OLED can have its own light-emitting technology, which reduces the backlight module and the lower polarizer, and is structurally lighter and thinner. Second, the all-solid structure is highly reliable and bendable. The OLED device is an all-solid structure, has no vacuum, liquid substance, and is superior in shock resistance to LCD devices, and can be fabricated on a flexible material substrate, thereby enabling flexible display. Third, the color gamut has a wide viewing angle and a fast response, and is suitable for the needs of wearable devices. The color gamut is wider: OLED's NTSC standard color gamut can reach 110%, while LCD is only 70%~90%; the viewing angle is wider: OLED self-illumination makes the viewing angle reach 170 degrees; the response speed is faster: OLED display The response speed is far faster than the LCD screen, and there is no tailing when displaying the dynamic picture. Full screen: Under the limit of screen size, the narrow border around is a new trend. OLED applications are very wide, including TV, smart phones, smart wear, VR, car display, car lighting and so on. At present, the OLED penetration rate in the smart phone field has reached 15%, and many high-end models also use flexible OLED screens. Among the high-end smart watches, almost all AMOLED displays are used. 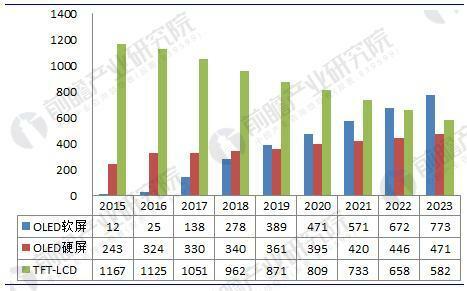 The scale of OLED for mobile phones has increased rapidly, and the market penetration rate has increased year by year. According to statistics, in 2015, the number of OLEDs for mobile phones was 255 million, while the number of TFT-LCDs used was 1167 million, and the penetration rate of OLEDs was only 17.9%. With the continuous improvement of the performance of smartphones, OLEDs Its superiority continues to erode the mobile phone screen market. In 2016, the scale of mobile phone OLEDs doubled to 349 million, including 25 million OLED soft screens and 324 million OLED hard screens. In 2017, this scale remained. With the rapid growth momentum, the use of OLEDs for mobile phones has reached 468 million, and the overall penetration rate of the market has also reached 30.8%. As the application technology of OLEDs in smart phones continues to mature, the penetration rate of OLEDs will continue to increase. 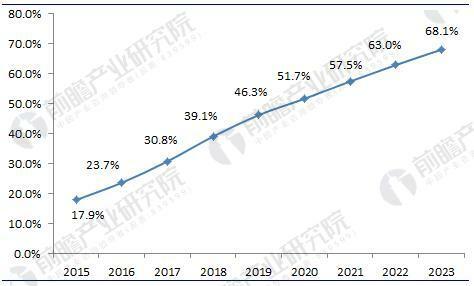 It is expected that the penetration rate will reach 68.1% by 2023, which will gradually replace TFT-LCD. The domestic OLED industry has a hot layout, and the overall market size has exceeded US$6 billion. China OLED industry has certain R&D and industrialization capabilities, and some areas have independent technologies. At present, there are about 40 universities and research institutions engaged in OLED technology research and development in China, and many companies are involved in the industrialization of OLED. In June 2011, 19 OLED enterprises and institutions in China jointly launched the China OLED Industry Alliance. In the liquid crystal display, China has formed five panel industry clusters in Beijing-Tianjin-Hebei, Pearl River Delta, Fujian-Taiwan, Yangtze River Delta and Midwest. Since 2016, some leading manufacturers in China have carried out large-scale layout in the field of OLED industry. For example, the 6th generation 1500mm*1850mm OLED substrate of Mianyang, which was founded by BOE in 2016, has an investment quota of 46.5 billion yuan and is expected to be completed in 2019. The 11th generation TFT-LCD and AMOLED new display device production line project put into production by Huaxing Optoelectronics in 2016 has an investment of 58.3 billion yuan and is expected to be completed in 2019. In short, in the high-speed development of OLED, most companies in China have begun to focus on this field.